Above is a picture of me as I and about 60 others start the 2006 Kirkland Tri-It Triathlon. The Tri-It differs from a regular sprint triathlon in that the swim is 0.25 miles instead of 0.50 miles. 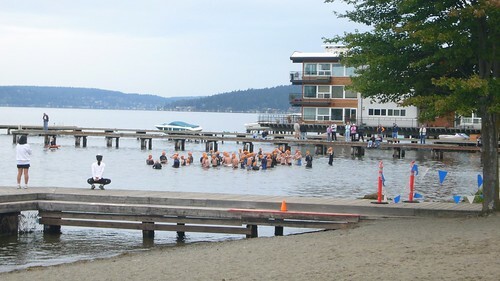 The race started off with a 0.25 mile open water swim in Lake Washington, followed by a 12 mile bike ride through the city of Kirkland, WA and finished with a 5k run along the shores of Lake Washington. My training included miles and miles of running, biking and swimming. I’d bike 20 miles and then run 2.8 miles or I’d run 5.6 miles and throw a 0.25 mile swim in the middle for fun. Most of my training I did on my own, which I think makes this all the more of an accomplishment. I didn’t race because a friend of mine was racing and training. I trained and raced to prove to myself that I could do it. I did this for me. I got out of bed at 5AM Sunday morning to get over to the race for registration. After setting up in the transition area I wandered around for a bit, chatted with a few of the other participants and got myself a coffee. At 6:45AM I went over for the pre-race briefing and watched the first of fifteen heats start, which was the “elite” heat. My heat, the Tri-It heat, which is for beginners like myself, was the last heat to take off at 8:00AM. After meeting up with Carly and John to hand them my camera and phone I went off to wait for my heat. A short time later I was 50 yards from shore swimming for the first time in a wetsuit. I felt like I had a motor attached to me. The wetsuit kept me warm and boosted me out of the water, which I swear made me faster. A short change later and I was running my bike out of the transition area starting my 12 mile bike ride. The ride was simply amazing. I was making decent time and taking full advantage of my aero bars on some of the flats and longer downhills. This was by far, for me, the most fun part of the race, but that’s probably because I like my bike so much. The transition from biking to running was by far the worst. I’ve heard about your legs being all messed up during this transition and it’s true. My legs felt like putty and my left calf started cramping up. For the first few hundred yards I ran peg legged to get over the cramping. After that it was smooth sailing all the way to the finish. So how did I do? Well, for my first triathlon I’d say first place is a pretty good way to start things off (No, it’s not April 1st, the original results proves that). Granted this is amongst a field of all beginners (including me) of all ages, but I’m still quite happy with the results. You can view the entire photo set over at Flickr. I’d like to make a special thanks to John and Carly who climbed out of bed before 7AM on a Sunday morning to come to the race, take pictures and cheer me on. I’d also like to thank my training buddie, Ben, who introduced me to The Hill. The Hill made the run seem like a joke. 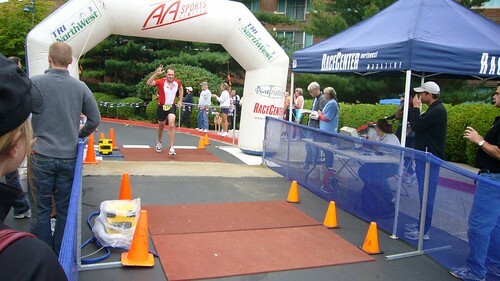 This entry was posted in biking, kirkland, running, swimming, triathlon by joestump. Bookmark the permalink.